Wow I can't believe I never uploaded some of this stuff. I have a soft spot for Goten and Trunks. Oh my god how adorable!!! Future Trunks knew Goten would lick kid trunks ice cream, so tries to stop him! awww!!!! so sweeeeeet they loooook!!!!!!!! This is sooooo cute!!! Two of each of them doubles the fun! Kid giten and trunks : who are these pll!!!!!!!!!!!! 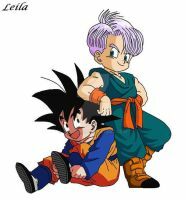 I luv trunks and goten there so cute. I love those two! great job! What a sweet picture! I love all these boys, and I really love how you drew Goten and Gohan, So cute! nice man! u have fun looking for more of these! Really nicely done!! 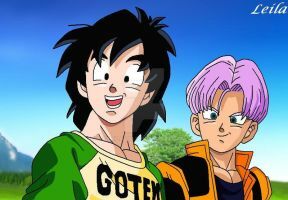 My fave character frm DB would be Trunks and I just love his relationship with Goten! Aw, this is so cute and sweet. Uh...heh, pun.